서울의 자동차 등록대수는 80년대 이후 급속히 증가하여80년 약 20만대에 달하던 자동차 등록대수가 2000년 현재 240만대를 넘어 서고 있다. 이러한 자동차 보급의 증 가는 간선도로의 통행속도를 급격히 낮추고 있다. 주요 간선도로별 속도를 살펴보면 외곽지역 일부도로의경우 35Km 이상의 속도를 유지하나 도심부와 부도심 일부지역은 15Km이상의 속도를 내기 어렵고, 대부분의 구간에서 시속 20Km이하의 속도를 나타내고 있다. 주요 지점별 교통량을 살펴보면 한남대교를 비롯한 한강 교량들에서 통과교통이 많으며, 인천시, 성남시, 고양시 등 수도권 주변 도시들을 연결하는 간선도로에서의 교통량이 많아 강남 강북간 교차이동과 수도권과 서울의 직주 분리현상이 교통량 조사에 반영된 것이라 볼 수 있다. 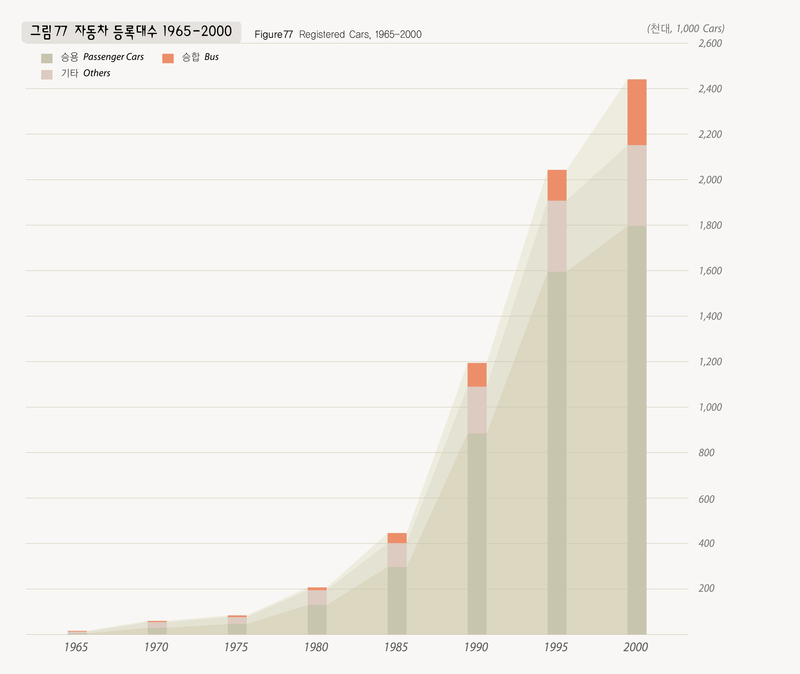 Number of cars registered in Seoul has increased sharply since the 1980s. 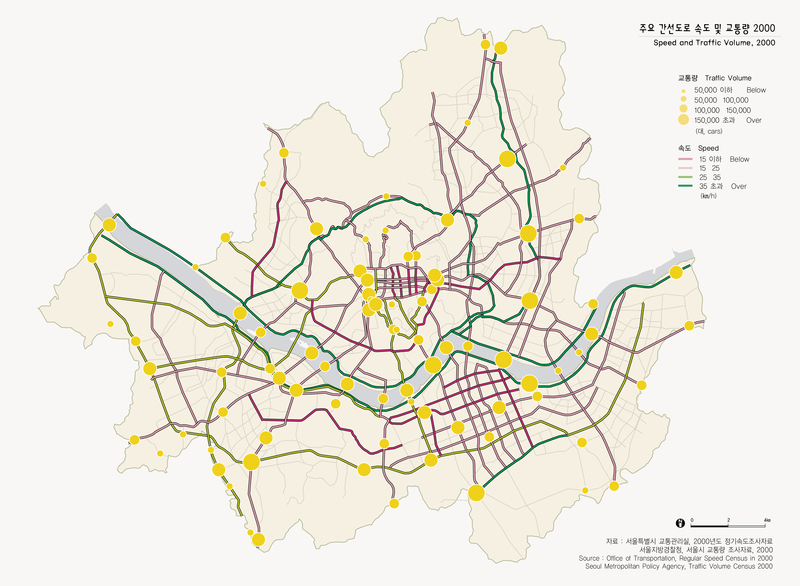 In 1980, Seoul had around 200,000 cars but by the year 2000, it reached 2.4 million. Such a sharp increase of cars distinctively slowed the driving speed on the main roads. Driving speed respective of major main roads are that some roads in the outer ring region of Seoul maintain 35km driving speed, however in the downtown areas and some areas in the secondary center of the city driving speed is less than 15km in most of the roads, and the average driving speed is lower than 20km. Traffic volume at major intersections are mostly at the bridges over the Hangang River and major main roads in Incheon, Songnam, and Koyang and other suburb cities of Seoul have huge traffic volume. It reflects the huge cross section traffic volume between the Kangnam and Kangbuk regions and the separation of offices downtown and residences in the suburbs.